John Olsen fine art print work titled Frog Swimming is a Limited edition fine art reproduction print, hand signed lower right by the Artist. Frog Swimming has been blind embossed in the corner with a Kookburra design and drawn by John Olsen to confirm authenticity. Strictly limited edition of only 65 (one size only), plus 6 Artist’s proofs, Etching House offers lay buy for all John Olsen prints and etchings. Frog Swimming is printed using Japanese pigment ink onto 308gsm Hahnemuhle fine art museum standard archival paper. Framing for John Olsen Frog Swimming print is available if you wish both in Sydney and Melbourne. Shipping, Etching House ships John Olsen prints and etchings globally, insured and tracked with a door to door service. Etching House has available a range of John Olsen limited edition fine art Etchings and prints; Lay Buy is welcome up to 12 months. Etching House has over 80 John Olsen fine art limited edition etching and print images available. Etching House specialize in Fine art, Etchings and prints by Iconic Australian artist like – John Olsen, Jeffrey Smart, Tim Storrier, Garry Shead, and Norman Lindsay. John Olsen hand signed and titled reproduction fine art limited edition print titled “Anticipation” and “Waiting” Sold Out……….Etching House. John Olsen hand signed and titled reproduction fine art limited edition print “Mt Kenya” Sold Out……….Etching House. John Olsen Sydney Sun, Anticipation and many other artworks by John Olsen can be seen at Etching House Melbourne and Sydney Art Show. The use of fine art rag mat paper and quality pigment ink are still the key ingredients. The original capture of the work being produced is by high tech digital means, or film in some cases. The product source is from an original painting often from the archive of a life time’s work. The objective is to make an affordable range of fine art prints that are produced digitally for efficiency, cost and quality. In the case of a few artists like Jeffrey Smart, Norman Lindsay, John Olsen, Margaret Olley, Tim Storrier it has been their objective to share with the public an accessible affordable body of art works of their archive presence and availability of works for the future generations to enjoy. Let’s face it; most of the original paintings by many of the iconic Australian artists are in private collections often never to be seen again by the public. The one thing that Etching House is passionate about is that the works of art are represented for what they are, each type of work and medium has its place, by price, by medium, by artist and as one may rightly assume there is not a lot of money in these fine art digital reproductions but oh so rewarding to see them make people happy. When one considers the costs, the true benefit is for the public to be able to enjoy and afford a representation of their favorite iconic Australian artist of their choice. Etching House is in business for the love and passion of Etchings prints and digital prints, it is the best way Etching House can share the world of art with the wider Australian public. A collection of John Olsen fine art is available at Etching House Sydney and Melbourne affordable art show. John Olsen Etchings and Prints on fine art rag paper with pigment ink available at Etching House, lay buy welcome. John Olsen original etching, Jump 1, Jump 2, and fine art reproduction limited edition prints tiled Sydney Sun, Anticipation, Popping Blue Bottles, Wet Season 1997, Etching Studio, and Five Bells all available while stocks last. At Etching House we deal in John Olsen fine art Etchings, prints, works on paper, paintings, limited edition painting reproduction prints, water colour art work on paper, limited edition prints, and collectable prints. John Olsen Fine Art at Melbourne annual affordable art fair stands A7 Etching House. John Olsen 1976 etching collection just arrived for sale, won’t last. John Olsen book titled collector’s edition for sale Etching House. Rare John Olsen art works for sale at Etching House. John Olsen art for sale on lay buy program at Etching House. Five Bells original oil painting by John Olsen Australian Artist born 1921 January 1928. The following information is a comparison to the limited edition fine art reproduction of Five Bells Print. Reproduction -Title Five Bells – Edition 250 sheet size 91x94cm large, 112x116cm extra-large. Signed Lower right and titled by John Olsen. Frog and Fly limited edition fine art colored frog print, edition 90 released June 2011, John Olsen new Frog and Fly at Etching House selling fast. Title…….Five bells – Original painting Year 1963 Painting Oil on hardboard Dimensions 264.5 x 274.0cm, Signed and dated in the lower right corner, “John Olsen ’63”. Affordable John Olsen fine art titled Popping Blue Bottles, Sydney Sun, Anticipation, and Tropical Lilly pond, Frog and Fly and Five Bells at Etching House. Australian affordable fine art prints etchings by John Olsen. Anniversary or birthday gift John Olsen fine art etching and print from Etching House Gallery. Etching House specialize in John Olsen fine art prints as well as paintings, etchings, as well as fine art and photography from many other Australian iconic and up and coming artist, example, with fine art Landscape there is Jason Benjamin, Fine art Photography of Landscape and nature by Paul Woolveridge, contemporary fine art photography by A.I.P.P master photographer David Oliver and Robert Billington who have brought some amazing limited edition prints to Etching House, available in color and black and white. Etching House is a leading supplier of Australian fine art photography, fine art paintings, etching, prints by the iconic artist such as Norman Lindsay, Jeffrey Smart, Garry Shead, John Olsen, Jasper Knight, Hugh Sawrey, Michael Leunig, Margaret Olley, Tim Storrier, Charles Blackman, Ray Crooke, Pro Hart, Sidney Nolan, David Boyd, Frank Hodgkinson, Arthur Boyd along with works of fine art by Jamie Boyd, Lin Onus, Jason Benjamin, Fred Cress, Melissa Egan, Barbie Kjar, Malcolm Jagamarra, Clifton Pugh, Sidney Nolan, Anthony Lister, Helen Norton, and Salvatore Zofrea. Etching House also may provide professional framing for your John Olsen print with services available in Melbourne and Sydney, Etching House Ships directly door to door as well as by Australia Post. Etching House by arrangement may call to your office or home if requested and show selected works. If you are looking for art for investment or just enjoyment please let us know, Etching House Buy Sell Trade and consignee works of fine art for sale. Etching House also supplies a network of Galleries around Australia with selected stock on a wholesale and semi wholesale basis, talk to Etching House to see if you are eligible for this product. Etching House has over 25 years of experience in the field of buying selling and trading in Australian fine art paintings, etchings, works on paper and fine art prints by John Olsen. Etching House makes buying and collection fine art paintings, etchings and prints by Australian artist affordable and possible with ease. Etching House now ship John Olsen fine art prints and etchings to London, Hong Kong Beijing. 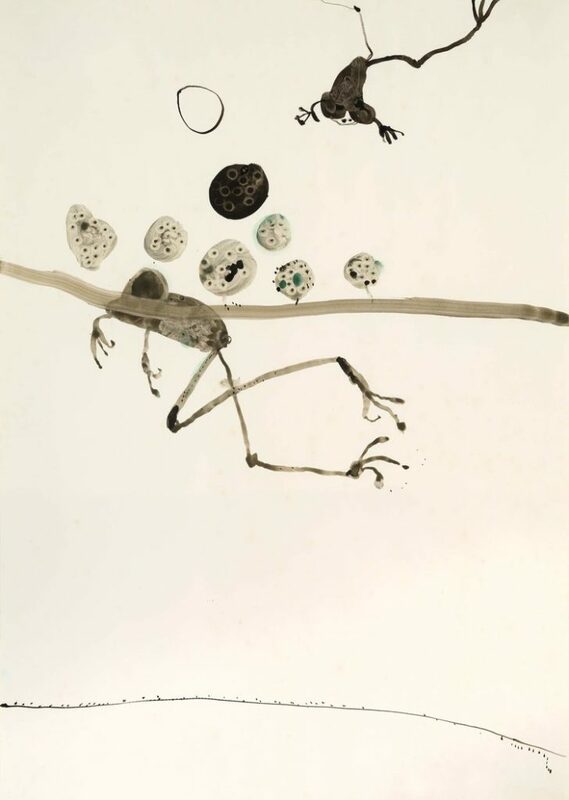 John Olsen “Sunday Morning Tree Frogs” Popular limited edition started in 2011, in stock at Etching House. John Olsen “Anticipation” finished edition from 2009 it has sold out and seen some appreciation on resale. This is a truly exceptional image.